“If she hadn’t been a Were-bat, then this would’ve been an autopsy.” The scene quickly turns from an episode of SUV into something more horrific. It’s readily clear the victim, a lycanthrope, was attacked by something supernatural in this dark urban fantasy novella. Occult bounty hunter Deacon Chalk learns her name is Fallene. “I would hold on to her name as a talisman of vengeance as I hunted out whatever was responsible for this.” Based on puncture wounds she received, Deacon realizes it’s vampires. The opening chapters take place in a clinic for the lycanthrope community. There’s some great world-building here giving readers a glimpse into the series’ supernatural world. Everyday humans are ignorant of these creatures, but it’s Deacon’s job to hunt “the supernatural down when they become a threat to mankind.” He’s the “bogeyman” to the monsters. The stakes in this novella are extremely high. Let’s just say the vampires make use of what’s essentially a rabies bomb. The trail of clues leads to a carnival with circus tents and rides… and clowns. Worse, it’s not abandoned and full of civilians blissfully unaware of what lurks beneath. Well, at least they were until they ended up in the big tent. And they truly are. Think of the archetypal carny sideshow characters as vampires. They’re all led by the Ringmaster of the Cirque Du Sangre. “Welcome to our show tonight. It’s gonna be a scream!” the Ringmaster says to Deacon and co. It’s a battle to end the vampires and find a cure for infected lycanthropes. The descriptive language also adds to the horror element. “…tearing out a chunk of undead muscle in a ragged gash that vomited gorelike pudding.” Eww. The Deacon Chalk novellas are fast-paced and action-oriented, but make for a good introduction and extension of the series. And Deacon doesn’t just breeze through his adventures. Like the very first line indicates, he’s a multi-scarred survivor of encounters with nightmares. 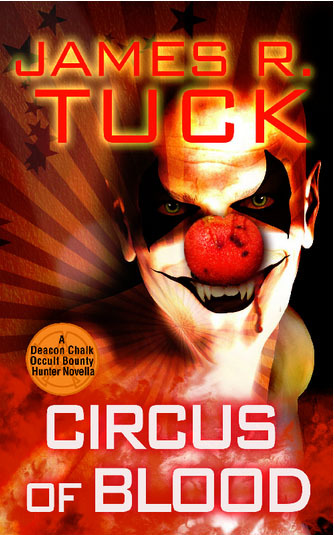 Circus of Blood is the third novella by author James R. Tuck, and its story is set between book two, Blood and Silver, and book three, Blood and Magick. The Deacon Chalk: Occult Hunter series may appeal to fans of Dean Koontz and Rob Thurman.